Amid spiralling crime and violence in the marginalised South African township of Galeshewe, local resident Pantsi Obusitse has formed a vigilante group called Operation Wanya Tsotsi. The group has set about administering its own DIY brand of justice with a focus on corporal punishment. “People were angry; people couldn’t take it any more. We went out with machetes, spades. Every weapon that is there. We were carrying weapons. We went out to hunt these boys. Because we know them, who are terrorising our communities,” says Pantsi Obusitse, chairperson of Operation Wanya Tsotsi. 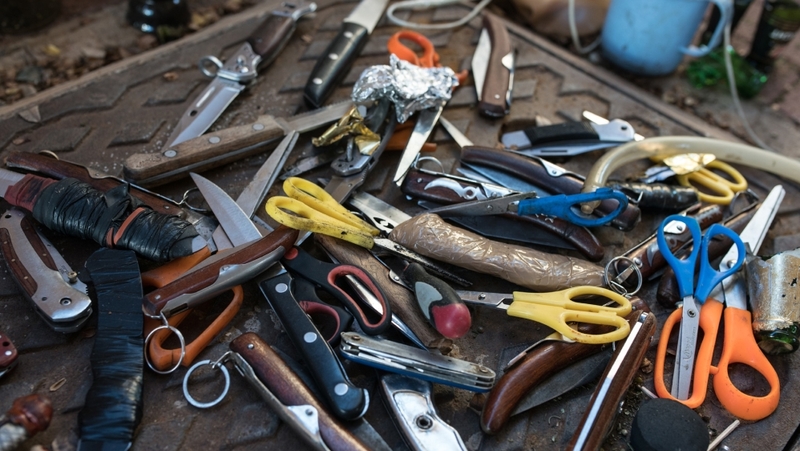 Despite its controversial methods, Operation Wanya Tsotsi has gained widespread support within Galeshewe and demand for the group’s limited resources is growing. But the response from the South African state and a stretched local police department has been ambivalent. The Reluctant Vigilante follows the trajectory of Obusitse, his continuing quest for legitimacy in a country with a long and often brutal history of vigilante violence, and his complex relationship with law enforcement and the local community. When we first stumbled across the Facebook page of Operation Wanya Tsotsi sometime in late 2016, we were instantly enthralled. Less than two years after this vigilante crime-fighting group had been formed by local residents in the labyrinthine township of Galeshewe on the outskirts of Kimberley, South Africa’s famous diamond city, it had amassed more than 10,000 followers (the number has since increased to close to 15,000) and removed a staggering amount of weapons and contraband from the streets. Right from the outset, we both felt a strong sense of ambivalence with regards to what we witnessed, something that we continue to grapple with to this day … To an outsider, the violence, albeit restrained, is often hard to stomach and sometimes appears completely arbitrary. It also illustrates the group’s limitations. A cursory glance at Kimberley’s crime statistics only increased our interest. According to official crime statistics, in Operation Wanya Tsotsi’s first year, Kimberley’s consistently high rates of armed robbery had come down by approximately 40 percent; murders had been similarly substantially reduced. Set against the backdrop of spiralling violent crime in South Africa and the failure of the criminal justice system to address it, Kimberley appeared to be a compelling anomaly. We found ourselves wondering if Operation Wanya Tsotsi could come to serve as a blueprint for community crime fighting in South Africa’s poorly policed townships, while simultaneously challenging reductive narratives about vigilantism in such spaces, where the word is usually equated with brutal mob-justice killings. We managed to get in contact with some of Operation Wanya Tsotsi’s leaders, who proved to be surprisingly media-friendly, and in April 2017, we made what would be the first of a number of trips to Galeshewe to embed with the group. We joined members on their nightly patrols throughout the township, documenting their criminal investigations and routine stop and frisks, as well as the highly ritualised use of corporal punishment and Facebook shaming that are central to their modus operandi. Right from the outset, we both felt a strong sense of ambivalence with regards to what we witnessed, something that we continue to grapple with to this day. On the one hand, the extreme dearth of state services that necessitated Operation Wanya Tsotsi is glaringly obvious in the breadth of the group’s workload, which ranges from apprehending multiple criminal suspects each day to diffusing domestic disputes and even taking sick or injured residents to hospital. Equally apparent is the altruism that motivates the group’s leaders, who constantly put their lives at risk and have made considerable sacrifices, financial and otherwise, in their attempt to make Galeshewe safer. Operation Wanya Tsotsi is obviously much-loved by most of Galeshewe’s residents, many of whom vociferously encourage the instant DIY brand of justice the group administers and have long since lost faith in the police. But at the same time, to an outsider, the violence, albeit restrained, is often hard to stomach and sometimes appears completely arbitrary. It also illustrates the group’s limitations. Without state support, Operation Wanya Tsotsi has been restricted to taking a reactive approach born of frustration. The group does not have the means to address the root causes of violent crime in Galeshewe, including rampant poverty and unemployment, in any meaningful way. As Dr Mary Nel, an expert on vigilantism in South Africa, once told us, while the state might condone Operation Wanya Tsotsi’s results, they’ll likely always condemn the methods. But the group maintains that it’s precisely these methods that are integral to the results. It’s hard to imagine a way past this impasse. Pantsi Obusitse, Operation Wanya Tsotsi’s enigmatic leader and our main character, both inhabits and embodies the complex and contradictory context of our film. As a government labour relations officer by day and a vigilante by night, he constantly blurs the line between formal and informal justice. Having spent more than a year getting to know Obusitse, it’s as easy to empathise with him and understand his motivations as it is to question certain controversial aspects of his approach and his ideologies. But as The Reluctant Vigilante shows, Obusitse doesn’t shy away from such scrutiny. He’s well aware that it comes with the territory. When that day will come, and whether such an end would justify the means, remains to be seen. Next : In Paris, the Art Scene Is Happening. London Had Better Look Out.